Drumheller, Alberta – We hear terms like sporty thrown around a fair bit these days, and the thriving SUV and crossover segments are no exception. Granted, automakers need to hype up and market their products, but consumers today can see through the facade. And when claims are made we’re going to hold brands accountable. From a crossover’s “super sporty design” to vehicles that blatantly misuse the word (the Santa Fe Sport? ), only a select number of models are truly deserving of this moniker, in our opinion. Right now, there’s no question: the crossover and sport utility markets are on absolute fire as consumers can’t seem to get enough. And while Mercedes-Benz introduced an all-new replacement for their popular, boxy GLK in 2016 with the GLC SUV, they wasted no time adding a new, sportier version to the mix only a year later with the 2.0L turbo-powered 2017 GLC 300 Coupe. As Mercedes-Benz accurately puts it, part SUV, part sports car, the GLC 300 Coupe offers consumers something a bit different compared to the non-coupe flavoured version with sleeker styling which sees a lowered roofline and enhanced performance and driving dynamics. And for those who really need to ramp it up, the 362-hp AMG GLC 43 Coupe (in Sport+ mode!) takes this mid-size sport utility to an entirely different level, as you’d expect — less sport ute, more sports sedan. Both the GLC SUV and GLC Coupe find the same 2.0L inline-4 turbo engine that’s built in-house, but only the latter (and the robust AMG GLC 43) get the 9G-TRONIC automatic transmission with paddle shifters as standard — the only vehicle in its class offering this. With 241-hp, the turbo-powered GLC 300 Coupe provides enough ponies to get the job done. Again, the GLC 43 is the go-to if it’s insane performance you’re yearning for. On the road, the GLC 300 drives smooth and there’s very little turbo lag from the engine. Add the 4MATIC all-wheel drive to the mix and the Coupe results in a pretty well-rounded sport utility. 0-100km/hr in 6.5-seconds pales in comparison to the AMG GLC 43’s 4.9-second dash, but hey, let’s be reasonable. The Coupe provides enough performance to match the sporty looks but overall keeps comfort and tight handling front and centre. And for a more dynamic driving profile, there’s always the option to pop the GLC 300 into Sport+ drive mode which increases throttle response, adds more direct steering, and offers more modified shift points. You can tone this down in Sport mode, or opt for Comfort (more balanced and fuel-efficient) or Eco for optimal fuel-efficiency. There’s also Individual drive mode parameters for the more ambitious types. We drove on long, dead-straight stretches of country highway with patches of gravel, unpaved and overall beaten roads where Comfort really made sense, softening the suspension opposed to the jarring, tight suspension of the Sport/Sport+ which was brilliant on the city roads and windy highways (and passing slow trucks), making our journey that much better and exhilerating. Plus, the burly exhaust notes from the Sport+ sound incredible. Having all these Dynamic Select options may seem like overkill to some, but they do indeed help. Besides, the more control you have over your vehicle, the better. Everytime. Inside, the cabin and cockpit are snug — not something you’d associate with a sport utility. But it’s cozy and feels moulded, lending to a more sports car vibe without compromising cargo space; compared to the non-coupe GLC, this fastback version, even with this lowered rear roofline, still provides 500-litres of rear cargo space. That’s only 50-litres less than the GLC SUV. But seriously, if ‘how many litres of cargo space’ means nothing to you, as it does to us, check out our photo with a bunch of crap in the trunk to gauge for yourself. Also, the 40/20/40 split-folding rear seats will open up cargo space that much more (and we thinks this is better and more modular than your typical 60/40 split configuration in most vehicles these days). That said, if space is an issue there’s always the larger GLE Coupe as an option. The fit and finish and quality of materials throughout the cabin are top notch, as you’d expect from Mercedes-Benz. And the leather throughout is super durable — great for messy families and careless kids. The centre stack is clean; there’s a huge cavity for storage including USB ports and with the cover closed looks super tidy; the centre armrest storage is simply a large, straight-forward space to stash your stuff (also with 2 USB ports). The GLC 300 Coupe gets a good dose of standards as well, including a sliding sunroof, keyless start, keyless go, a leather steering wheel, dual climate control, and heated front seats. …there’s always the option to pop the GLC 300 into Sport+ drive mode which increases throttle response, adds more direct steering, and offers more modified shift points. Personally, I’m a fan of the boxy or more squared-off design cues (G-Wagon! ), and frankly, really liked the look of the outgoing GLK. While the GLC 300 replacement still retains a more conservative, less rounded look, my feelings were initially mixed on the GLC 300 Coupe’s styling — not that I didn’t particularly like it, but just needed time to really understand the design and what the fastback styling is all about. Similar to the BMW X6 SUV when it first came out; a polarizing exterior shape especially compared to its burlier X5 sibling. 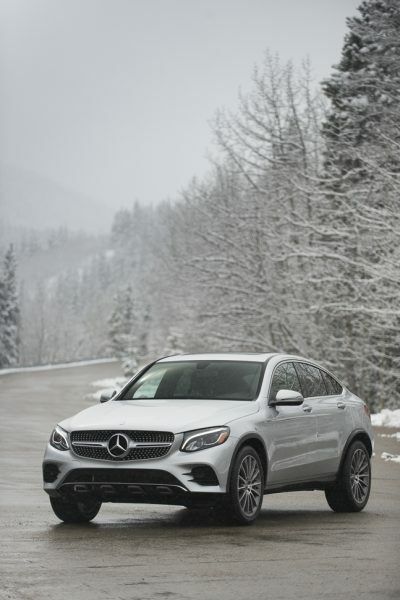 But when you get behind the wheel of this Coupe sport utility and really open it up on the highway, it all begins to make more sense — again, in the Mercedes-AMG GLC 43, it’s an entirely different experience. The long flowing design and fastback look indeed have a purpose opposed to simply looking fast. You feel as though you’re piloting a confidently-styled performance sports sedan that deservingly looks the part; one with exceptional power and handling that’s uncommon in competing mid-size SUVs on the market today. In other words, the sloping roofline design isn’t there to just the look ‘different’ but serves a purpose, and indeed does look sharp and progressive. 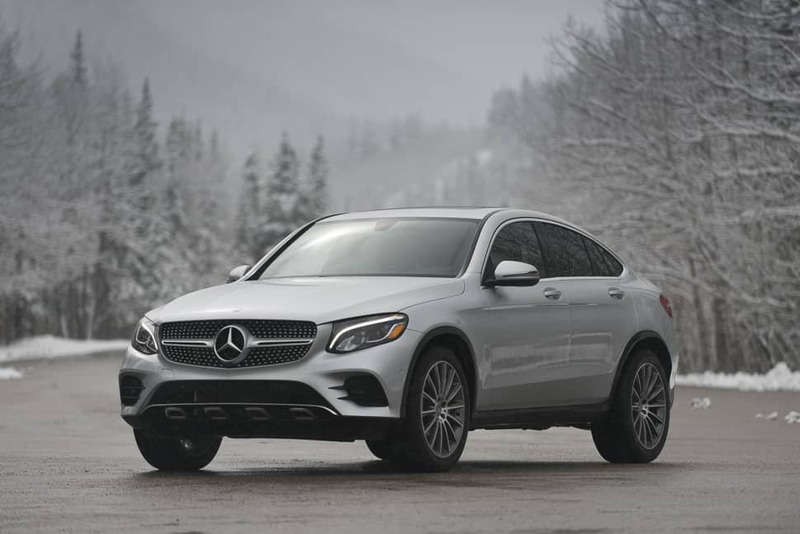 For those seeking the AMG look, the Sport Package ($1,800 CAD) is a reasonable upgrade enhancing the GLC 300 Coupe’s exterior styling to include a sport brake system, a sports exhaust, and huge 20-inch AMG multi-spoke wheels. The Night Package adds to this with more black trim features including black side mirrors and a blacked out grill. The Standard Package with those less enthusiastic wheels don’t do the GLC 300 Coupe any justice — it’s worth forking out the extra money on the styling for this one. Those seeking a more compact, nimble option can opt for the Mercedes-Benz GLA while families requiring more space will likely look at the larger GLE (or top-end G-Class for the adventurers), but the mid-size GLC SUV is an ideal, well-balanced option that would likely cater to most consumers. But there’s always that sub-group looking for a little more, whether it’s differentiated styling or enhanced, sportier driving dynamics. Or both. The 2017 Mercedes-Benz GLC 300 Coupe adds another layer to the mix for mid-size sport utility consumers who enjoy a more spirited journey. Best part? It’s actually sporty. The Concept Toyota CH-R Debuts for the second time - this time at Frankfurt Motor Show 2015. 2017 Hyundai Santa Fe Sport Review: Updated Styling. Well-Rounded. Sporty?